Minot State University's Dakota Chamber Music opened its premier season in June of 1996 under the artistic direction of Dr. Jon Rumney. In 1997, piano was added to the string program, giving DCM its current form. DCM serves high school students, university students, wind, string and piano teachers, and amateur and semiprofessional adult players from all walks of life. Over 80 performances of chamber music have taken place over the past decade. Participants have come from the following states and provinces: British Columbia, Indiana, Illinois, Iowa, Manitoba, Maryland, Minnesota, Montana, Nebraska, New York, New Jersey, Ohio, South Dakota, Tennessee, Utah, Wisconsin and all major cities and several small towns in North Dakota. Resident faculty ensembles have included: the Ying Quartet, Beo, the Fry Street Quartet, the Daedalus Quartet, the Avalon Quartet, and Luminus. Additional coaches have included Bill Lipke, Dennis Simons and Penny Simons (Minot State University), Elinor Freer (Eastman School of Music), Andrew Smith (University of Nevada, Las Vegas), and Laura Prokopyk (concertmaster, Bismarck Mandan Symphony). Faculty performances have been broadcast over public radio, and have included pieces by numerous composers, including commissioned works by Paquito D'Rivera and Carter Pann. DCM has been mentioned in national publications such as that of Chamber Music America, and has served as a model of chamber music study in other areas of the country. 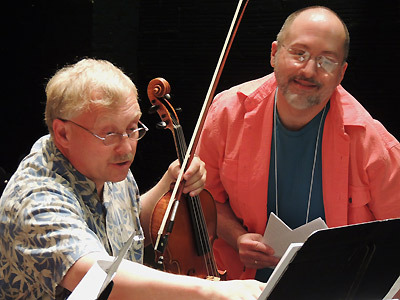 In 2003, DCM received the Distinguished Service Award from the North Dakota String Teachers Association.